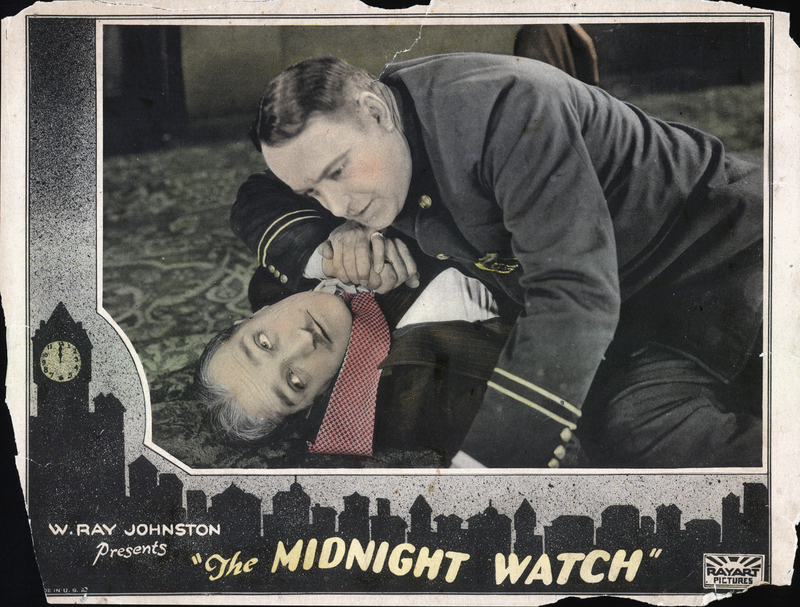 "The Midnight Watch," produced by Trem Carr Productions Ltd., distributed by W. Ray Johnston's Rayart Pictures Corp., released in February 1927. Colorized lobby card, 10¼x13½ inches (probably cropped from 11x14). We can't be certain where it was shot — the film might no longer exist — but it was one of Carr's earliest productions under his own name, and it comes at a time when he was shooting in Placerita Canyon. He is known to have produced just three films prior to this one — two in late 1926 and one in January 1927. Johnston distributed them. A year later, in 1928, Carr and Johnston formed Syndicate Pictures (Johnston was president, Carr vice president); in 1931 they reorganized Syndicate into the first Monogram Pictures Corp. and Carr took out a 5-year lease on property that's now part of Disney's Golden Oak Ranch, just east of modern-day Highway 14. When the lease expired in 1936, Carr moved his act to property his friend Ernie Hickson had purchased down the road to the west, at what became Melody Ranch. Incidentally, in 1940, Johnston purchased the main house at 22931 8th Street (corner Wayman) in Newhall that vaudeville actor Charley Mack built in 1928. The tag line for "The Midnight Watch" (silent, 6 reels) is "The Everlasting Conflict Between Law and Order and the Underworld," suggesting it's a gangster film. It features Roy Stewart, Mary McAllister, David Torrence, Ernest Hilliard and Marcella Daly. It's written by Carr and directed by Charles J. Hunt, with cinematography by Harold Wenstrom. LW2506: 19200 dpi jpeg from original lobby card purchased 2013 by Leon Worden.